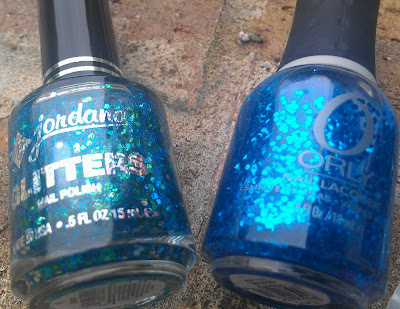 Jordana Glitters Cosmic: clear base with hexagonal green, turquoise and silver glitter, also has smaller turquoise glitter, not sure if they are "micro glitter"
Orly Flash Glam FX Spazmatic: clear base with hexagonal turquoise glitter, almost the same color as the turquoise ones in "Cosmic", it also has what looks to me like micro glitter, in the bottle it looks as if they are a darker blue but when applied they are very subtle. 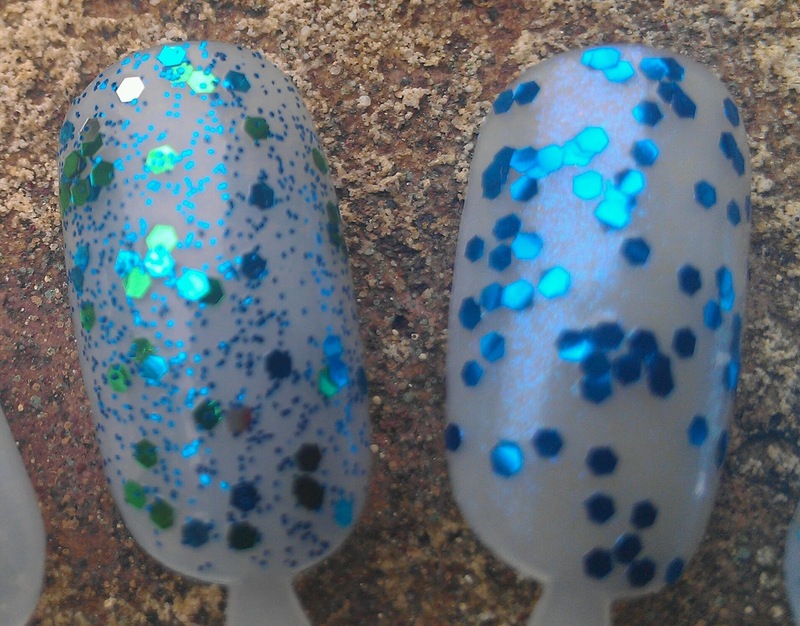 This polish seems to separate/glitter settles a bit which can be annoying but rolling it a couple times gets rid of that issue. OPI Going Gonzo': clear base, hexagonal silver glitter, small light blue glitter. 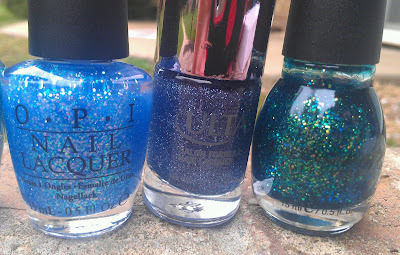 OPI Last Friday Night: clear base, small multicolored hexagonal glitter, the color seems to look different depending on the angle. Mine settles, like "Spazmatic", but rolling helps. Ulta Indigo-Go Girl: On the darker side, clear base, dark blue, a bit on gthe purple side small hexagonal glitter with smaller glitter on the same shade. Sinful Colors Nail Junkie: blue/green base, small hexagonal multicolored glitter. Jordana Glitters Cosmic (Left) and Orly Flash Glam FX Spazmatic (Right). 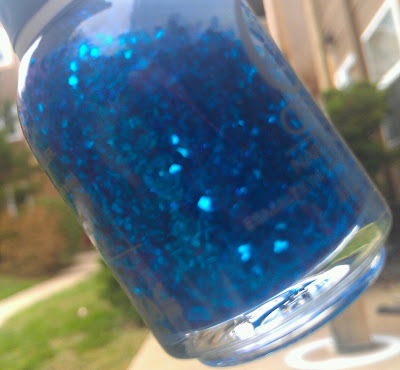 In this picture you can also see a bit of the dark blue microglitter in Spazmatic! Let me know what you think below, and don't forget to enter my Halloween Giveaway! 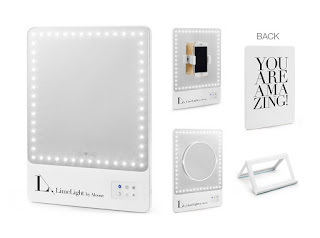 Thank you so much for this, I couldn't tell from your other blog but from this one I can clearly see that I like the Jordana glitters cosmic better than the spazmatic! Thanks for the comparison Fiorella! I have OPI Last Friday Night but was always scared to wear it because I thought it would look wild, but it's not at all! 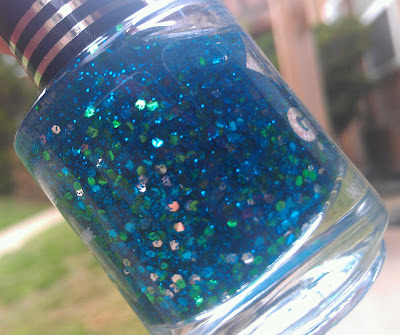 That Sinful Colors glitter is a stunner! 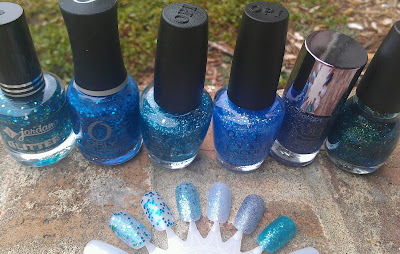 I'm not always a huge fan of blue polishes (especially flashier ones), but that one would have me giving blues a second thought. 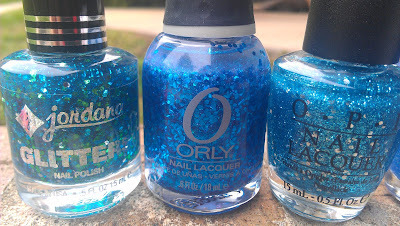 Lots of blue glitter! I love the fine glitters a lot of the last three. Beautiful!